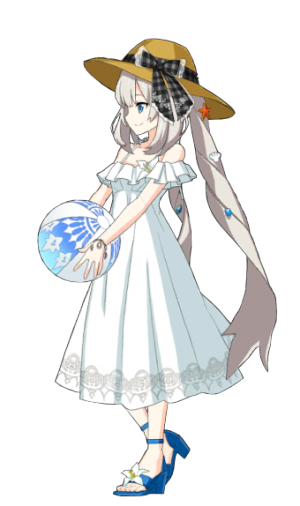 This article is for the 4★ , Marie Antoinette. For the 4★ , see Marie Antoinette. Increase your Debuff Success Rate by 4%. Decrease all enemies Critical chance by 20% for 3 turns. Overcharge: Increase party's critical damage for 3 turns. 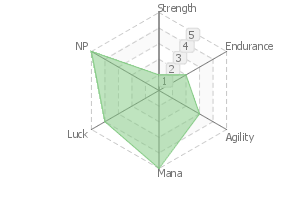 Increase Critical Damage of all allies by 25% while she's on the field. 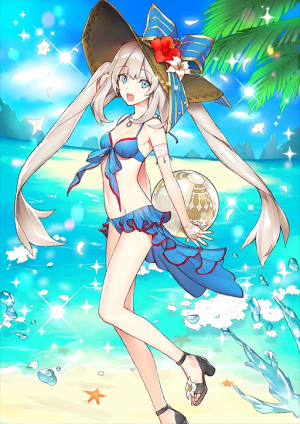 A sparkling and dazzling queen on the beach. 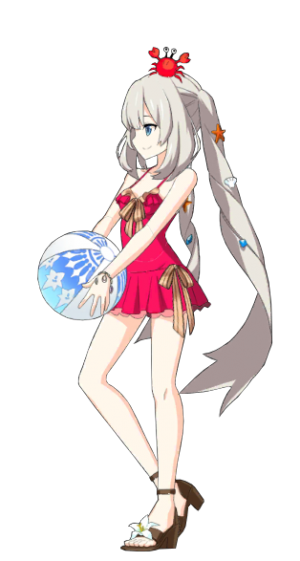 She uses a beach ball during combat. 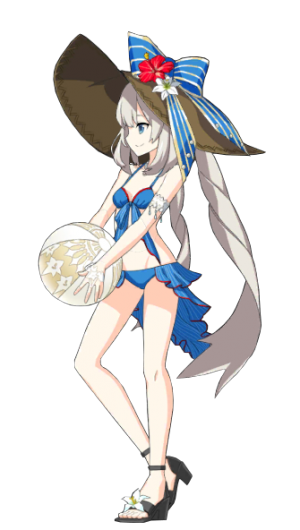 It is also possible that she is just playing on the beach without being aware of the combat. Whether it is at her palace or at the beach, the queen remains true to herself: the one and only Marie Antoinette. 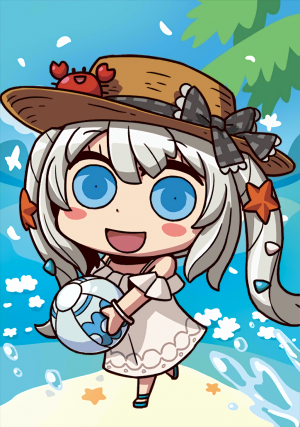 Even so, she still smiles more than when she is summoned as a Rider, perhaps due to having so much fun. She attracts people around her with her natural charisma rather than with her leadership skills. 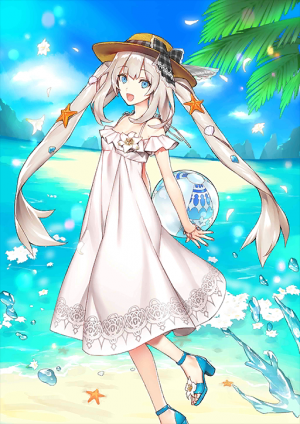 Due to the combined effects of this skill and Beach Flower, her mere presence allows her to be worshipped and protected as the princess of the beach. 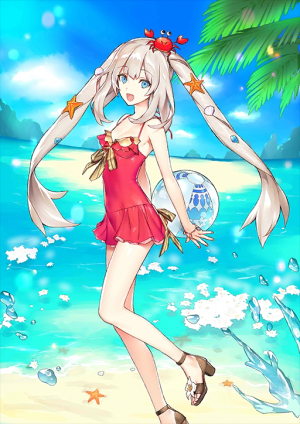 Having manifested in a swimsuit, she doesn't mind about exposure at all. Marie Antoinette continues to dazzle beautifully, delightfully, and gorgeously. In fact, she's so oblivious to her appearance, it amplifies her beauty in the eyes of others. Beloved Radiance for All Eternity. An illusion that existed since ancient times - the radiance of the royal authority itself is worn as a Noble Phantasm. 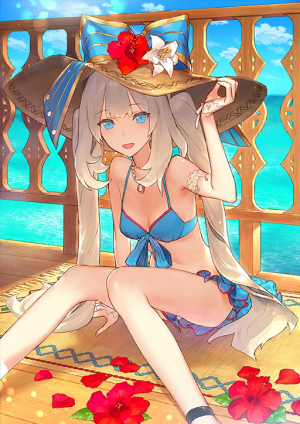 Witness Marie as the flower of sun, the flower of beach in full bloom. Super dazzling, shiny, radiant! Spending your summer with Marie Antoinette is sure to make you feel like you're living a dream vacation with a real celebrity. A dream will always end at some point, but memories will remain. ---twinkle-twinkle, a queen consort that glitters on the beach. This page was last modified on 18 August 2018, at 18:55.